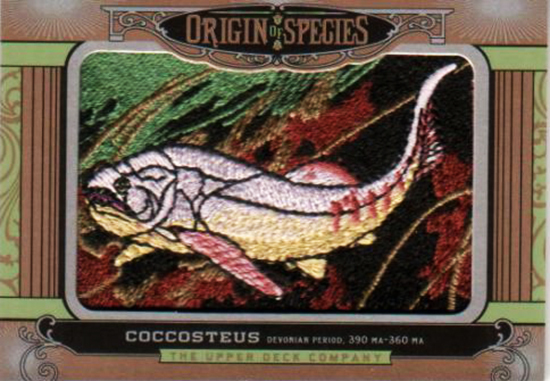 The popularity of Upper Deck’s Animal Kingdom patch cards in Goodwin Champions, and the astronomical amount the cards sell for on the secondary market, has been well documented. The series ran its course last year after dominating the non-sports collectibles category for three years. 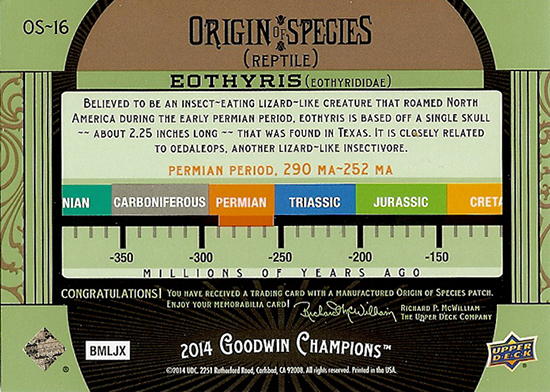 You can find the new Origin of Species cards in 2014 Goodwin Champions boxes. 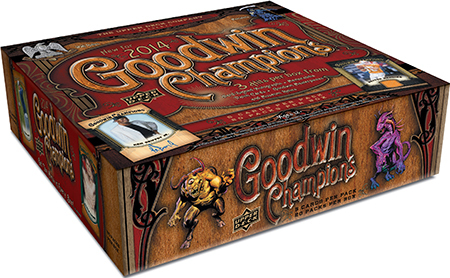 Cards OS-1 through OS-40 are Reptiles that fall 1:100 packs of 2014 Goodwin Champions on average. Cards OS-41 through OS-60 are Fish that fall 1:260 packs on average. 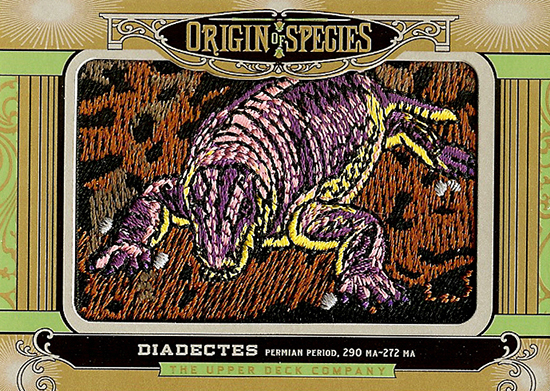 The backs of the cards tell about the creature and what prehistoric era they lived in. Cards OS-61 through OS-75 are Cambrians that fall 1:490 packs on average. Cards OS-76 through OS-87 are Arthropods that fall 1:860 packs on average. 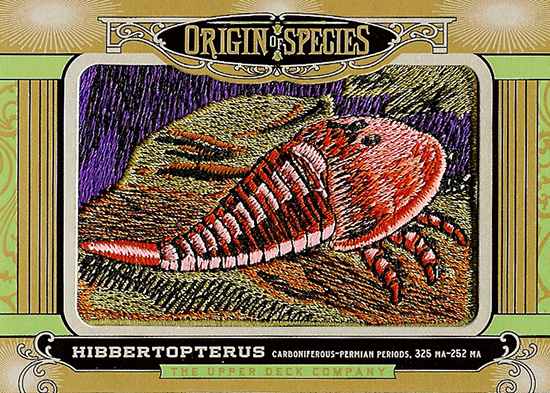 Cards OS-88 through OS-97 are Tetrapods that fall 1:1,715 packs on average. And finally, cards OS-98 through OS-100 are Cephalopods that fall 1:8,565 packs on average. To put together an entire set would be an incredible challenge, but we have seen collectors do it before. An important opportunity not to miss in terms of putting together the set it so jump on cards you see out there right away as the product is initially being opened as some of these cards you may only see a couple times. One thing in particular these insert cards have done is bring in non-traditional collectors into the category. As we’ve learned more about the types of collectors who put these sets together they are educators, women and even kids collecting with their parents. There is an educational aspect to these cards for sure, but they are also very striking and fans appreciate their beauty. This is the beginning of a three-year series for these cards that will ultimately lead us to dinosaurs!